The hardware has a few downsides but its size, price, and improving software makes it a winner. Light and portable, with USB bus power and MIDI I/O. Versatile and powerful MPC software at its heart. Sensibly priced. Only a few months down the line since we reviewed the MPC Renaissance, its more affordable sibling the MPC Studio is now available. It uses the same MPC software (minus the Renaissance's Vintage Mode) controlled by more compact and portable hardware. As the software is the same as the Ren, we'd like to refer you back to our Renaissance review for the software, features and operational basics. http://bit.ly/WrO9JP. "The MPC Studio's hardware feels pretty sturdy yet it's only one-inch thick"
The MPC Studio's hardware feels pretty sturdy yet it's only one-inch thick. Its brushed aluminium/plastic case looks slick and the pads feel much the same as the Renaissance (perhaps a little firmer) but no less responsive. The built in velocity curves and pad sensitivity levels ensure that you can record/play with the softest touch. There are still eight pad banks (four of which are accessed via the shift key function) with 64-note polyphony, and each pad lights up yellow, orange, green or red to show velocity levels, note events and other functionality. As there's no numeric keypad the pads can also be used in numeric mode to enter data. A fair bit has been lost from the Renaissance hardware to keep things compact and the price lower. There's no tilting screen or audio interface, only four Q-links instead of 16, and no ring LEDs (to name a few). The main downside for us is the fixed screen, as its readability is often compromised unless you are looking directly from above. A flip-out stand would have really helped, but you can prop up the Studio if necessary. Also, there's still no way to turn the display off to prolong the backlight or an overall volume control on the hardware. Akai has generally done a good job with the Studio's hardware and it strikes a good balance between functionality and compactness. The panel layout is conducive to fast workflow and owes much to hardware MPC's. The silver-painted rubber buttons have a positive click when pressed, though unfortunately they also squish about a lot and if you press them too hard on a corner, and they can get stuck under the panel, so be careful. The jogwheel (which is central to MPC operation) is much larger and flatter than on the Ren to keep things flush but even though it has ridges for gripping, you still have to exert some pressure to get it to turn, and your fingers can slide off the shiny surface quite easily. The same goes for the four touch-sensitive Q-link dials and scroll wheel (which is used to scroll through the software functions) - they are also quite slippery and hard to grip and would have been better with a rubberised surface. Moving onto the connectivity, there's a power button, bus-powered USB (for connecting the Studio to your computer) and MIDI in and out via included breakout cables for connecting external MIDI hardware. There's no built-in audio interface, so you are reliant on using either you computer's native inputs for audio/sampling or your USB/ FireWire/Thunderbolt interface. This doesn't really impact on general use, though of course it's very handy having dedicated ins and outs on an MPC for sampling and for splitting out elements across a mixing desk. If this is a deal breaker for you, then you should definitely consider the Ren instead, especially if you're after a new interface. 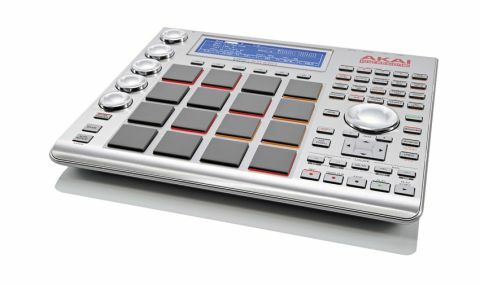 "OS 1.3 is a major update, addressing a lot of the main user concerns and thankfully Akai does appear to be listening"
Like the Ren, the MPC software will only work on Mac OS 10.6 upwards with the Akai MPC hardware connected (unlike Maschine) though you can map other controllers to the software (again as long as the Akai hardware is connected). We hope Akai removes this unnecessary restriction soon, as once your beats are down you often don't want the hardware connected, especially when editing on the move. In the main, OS 1.2 (which we're testing with the Studio) is stable but there are still some bugs and missing features including broken undo functionality, no hardware sample zooming, no search/ tagging in the browser and legacy file support needs improving. Some bugs have been addressed, though we wish Akai would acknowledge exactly which in the update PDFs. The 1.3 update (out on 15th Feb) is a major update, addressing a lot of the main user concerns and thankfully Akai does appear to be listening, with updates coming every couple of months. Upcoming enhancements in 1.3. include sample purge (for getting rid of any unused samples in your project), a new way to work with plug-in instruments and FX so that when you copy a sequence, the plug-in isn't duplicated, drag and drop folders of sounds, better reaction of the pad lights, and the ability to add/remove sample slice markers manually. There are also rumours that hardware zooming for sample editing will be implemented along with skins for third-party plug-ins. "The feel of the sequencer is tight and definitely up there with later hardware MPCs"
The operating modes are the same as the Renaissance, so again we'll refer you back to the Renaissance review for the intimate details, but rest assured, apart from Vintage Mode getting the chop, everything works in exactly the same way, whether loop recording beats, editing/chopping samples, adding filtering and FX, chaining patterns into a song or exporting. Although there are fewer Q-links, this doesn't really impact on workflow except when controlling external plug-ins, when you often need lots of real-time controller assignments. Timing correct (quantise) and sequencer timing are also the same as on the Ren, with a handy additional strength parameter (as in Logic Pro) but still in OS 1.2 there is no real-time quantise or beat stutter, both of which I would love to see. The feel of the sequencer is tight and definitely up there with later hardware MPCs, though when working on complex DAW arrangements we found a bug where the MPC software would sometimes lose beat sync with Logic, which was frustrating. Latency is thankfully negligible in general but it does depend on how complex an arrangement you are working with and your DAW's buffer size, especially in plug-in mode. Notably, the swing options sound very close to the hardware MPC models and basic beat tracking and sampling feels much like an old MPC. We hope Akai can implement a feature so that it's easier to keep track of the actual quantise values used on a per track basis in the future to further improve workflow, plus implement a proper undo history. And we'd still like to see a way so that you can record all your beats on one track, then split the elements to any of the other 128 tracks easily. Let's not forget there are still the versatile filter modes onboard, plus amp/filter envelopes, built-in FX, track mute, pad mute, step sequence mode and a powerful track and program mixer, but still no event list edit mode like old MPC's. In the main, the basics are in place, so let's see how things progress over the coming months. So far Akai seems to be responding to user requests well and that's the exciting thing with this new MPC software - it can be as advanced as Akai's small coding team choose to make it. If you want a credible alternative to the likes of Maschine, but with that familiar MPC workflow, at a more affordable price than the Renaissance, then we recommend grabbing the MPC Studio. For the travelling or studio musician it's a practical solution that's reasonably priced, and you even get a nice red protective sleeve thrown in!